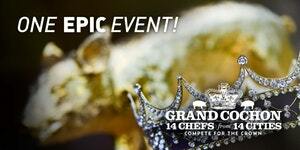 This Sunday, October 1, 14 Chefs from around the country will be in Chicago for Grand Cochon to showcase their culinary skill and compete to become the "King or Queen of Porc"! Each Chef will create no less than three bite sized portions from their own heritage pig. They will be using the whole animal- so be ready to enjoy some amazing and off the wall food. In addition to the 42+ bites in this communal feast, guests can sample Rosenberg's Deli's Chef Joshua Pollack's beef tartare with Sabatino's truffles, Pastoral Artisan cheeses and bread, La Brea's pop up bakery, organic pâté Les Trois Petits Cochons, a luxury butter and foie gras bar and much more! There will also be much to drink with wine, spirits, and cocktails from the Glenfiddich Experimental Dome, Breckenridge smoked Old Fashions, The Manhattan Project by Poached Jobs, collaborative Angostura and Perfect Puree's Tiki Bar, Courvoisier cocktails, and wines from Scholium Project, Kosta Browne, Pax, Silver Oak and more. The event takes place at Morgan Manufacturing on October 1. Tickets are available here. General Admission ($150) lets in at 5:55pm or you can splurge with the VIP pass ($225) which lets you in at 5pm. Hope to see you all at the pig out!